Laurie, your book and Bullet’s story has meant so much to me in the past two months. I began reading it while our dog Malibu was recovering from her lung lobectomy in November, (thanks to your foundation who had a HUGE hand in Malibu’s treatment). I continued reading it throughout the short remaining weeks we had with our other dog Hydro, who just one week after Malibu’s surgery was diagnosed with an inoperable brain tumor. We thought we had at least months with him, but unfortunately the tumor advanced quickly and aggressively and he wasn’t responding to the treatments we had tried to reduce the swelling to ease his pain and make him comfortable. Thursday he was no longer doing the things that made him Hydro, so we made the difficult and devastating decision to allow him to “cross the Rainbow Bridge” as you say in your book. 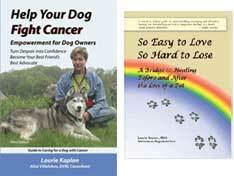 Your book provides a great insight in the emotional roller coaster a pet owner/caregiver may feel during all phases of having a dog with cancer. I appreciate the research, data, and plethora of information about every possible thing a pet owner may question. You even answered questions I didn’t know I had or didn’t know I needed to think about. In these past few days, as I have reflected and grieved, I have felt the emotions and had the thoughts you describe in your book. Reading it has helped me to realize that I need to not second guess our decision and know we did the best thing for Hydro. Moving forward I now have more information about different types of cancer, healthy options and lifestyles for our fur babies (food and providing a healthy home environment for them), and what to expect and how to approach cancer if any of our pets are ever diagnosed with it again. Thank you for taking the time to write this book, share your and Bullet’s story, and doing the research to help improve the lives of pets suffering from cancer and helping us owners get through it as well. 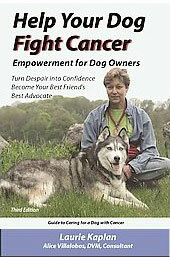 I will be sure to share your book with others and recommend it to our veterinarians so they can share it with others whose pets are diagnosed with cancer as well.